It has come to my attention that as a response to the cutback of opportunities for women in skateboarding, supporters are suggesting and endorsing boycotts. A majority of these are in response to Vans’ decision to terminate their contract with the legendary and inspirational Cara-Beth Burnside. Although your hearts are in the right place and your energy and support towards encouraging the progression of women in skateboarding is greatly appreciated, boycotting is simply not the way to go. In the specific case of the suggested Vans boycott, please remember that Vans is still putting on what is currently the highest-paying women’s transition contest of the year. And who’s going to be there flipping burgers? That’s right, Mr. Vans himself, Steve Van Doren. Vans has also backed (and continues to do so) the All-Girl Skate Jam for the past decade. From a business standpoint, does Vans have to do this? Not necessarily. Let’s face it, they have control over the skate shoe market whether girls skate in their shoes or not. So let’s give credit where credit is due. I owned a pair of white CB pro model Vans when I was about 12 years old. They were my first skate shoes. I loved those shoes so much I distinctly remember consistently scrubbing those things down with a sponge even though I skated them to pieces. Not only does seeing Vans and CB part ways hurt my soul, but it’s discouraging to see the vacant space on the Protec Pool Party banner every time I go to skate Vans’ combi bowl. But negativity breeds more negativity. The term boycott connotes too much hostility. 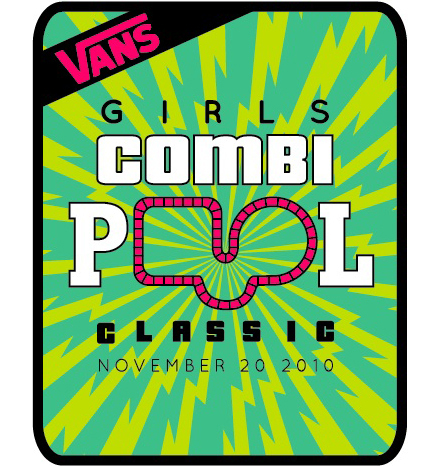 Vans could very easily decide to cancel the Women’s Combi Contest, their “Girls skate free nights,” and their girls’ skate clinics as a result of a boycott. So let’s instead be grateful for what we DO have and put our energies into something more positive. Help show that girls’ teams are beneficial for brands by purchasing product from and supporting the growth of existing girls’ teams. Exactly what I’ve been thinking, but I was too lazy to articulate it publicly. Thanks.